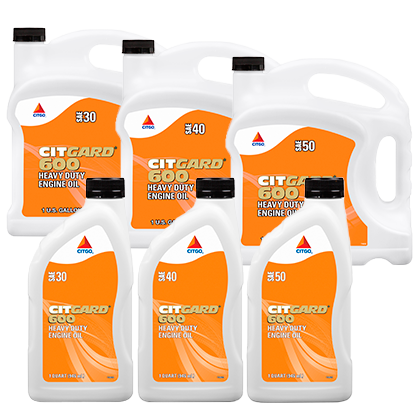 CITGO CITGARD 600 Engine Oils Monogrades are high quality, heavy-duty crankcase oils. This product line is manufactured with the latest additive technologies to provide excellent performance. SAE 30, 40, and 50 viscosity grades are designed with low sulfated ash to give optimal performance in Detroit Diesel Two Stroke Cycle diesel engines calling for obsolete service category CF-2. These mono-grade products also meet the performance requirements of obsolete service category CF. SAE 10W and SAE 30 viscosity grades have also passed the requirements of the Allison C-4 specification. These lower viscosity grade fluids are excellent for hydraulic applications calling for Allison C-4 and / or Caterpillar TO-2 performance with engine oil type technology additive systems.